DNR geologist Stephen Slaughter photographs the newly exposed hillside at the site of the Whidbey Island landslide on March 27. Photo: Isabelle Sarikhan/DNR. More photos on Flickr. Incident: Early in the morning on 3/27/2013, along Driftwood Way in the Ledgewood Beach Community in Coupeville, Whidbey Island, residents awoke to a noise that sounded like thunder or a sonic boom. A large landslide caused damage that was hundreds of feet wide. Initial reports are that seven homes were threatened and 17 more are isolated. No one was injured. A Department of Natural Resources (DNR) Division of Geology and Earth Resources team is working with local emergency responders and the Island County Emergency Management Division to survey this landslide and understand the incident and its risks. 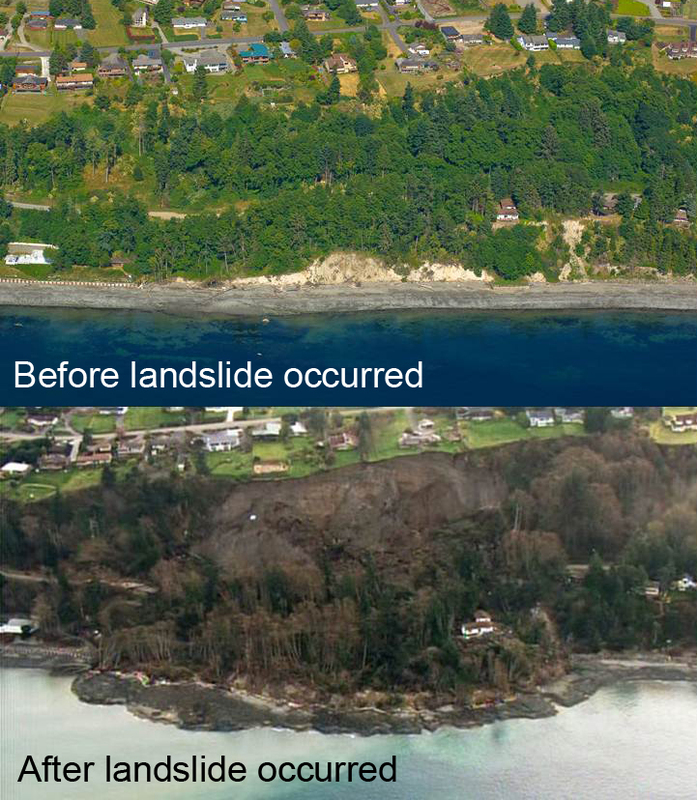 6:25 p.m. (3/28/2013): DNR geologists release their quick report on the Whidbey Island “Ledgewood-Bonair” landslide. View the full report here. – The Ledgewood-Bonair Landslide (LB landslide) on Whidbey Island, Island County, Washington occurred around 3:45 am on March 27, 2013. – It is a small portion of a much larger landslide complex, approximately 1.5 miles long, that was prehistoric and may date back as far as 11,000 years. – The top of the landslide scarp averages 200 feet above sea level. – The landslide pushed (uplifted) the beach as high as 30 feet above the shore. – The toe (front of landslide at the beach) is slightly over 1,100 feet long and extends approximately 300 feet into Puget Sound. – Uplift of the beach is presumed to have been relatively slow (i.e., over a few minutes). – Wave and tidal action is actively eroding the toe with small sections (1-10 cubic feet) observed calving with the rising tide. – The volume of material moved was approximately 200,000 cubic yards (equivalent to 40,000 dump truck loads). – DNR geologic mapping from 2009 shows the extent of the landslide complex (Polenz and others, 2009, http://www.dnr.wa.gov/Publications/ger_gm68_geol_map_camano_24k.pdf). – Where observed, the access road has been shifted approximately 80 feet down vertically and to the west. The volume of material moved was approximately 200,000 cubic yards (equivalent to 40,000 dump truck loads). – The slide displaced approximately 5.3 million cubic feet, or about 200,000 cubic yards of earth. – This slide started moving at least as early as 2002; possibly earlier. The north side shows movement from 2002; the south side shows no historical movement. – This is a Translational Deep-Seated slide with rotational blocks above. For more information on understanding these different landslide elements view DNR’s Landslide Factsheet. – This is almost the exact same mechanism that caused the Nile Landslide in October 2009. Is the land still moving? Will it keep moving? Once an area slides, it will try to stabilize itself. The land will slowly move in an attempt to do this. The chance of another catastrophic movement is low; but possible. 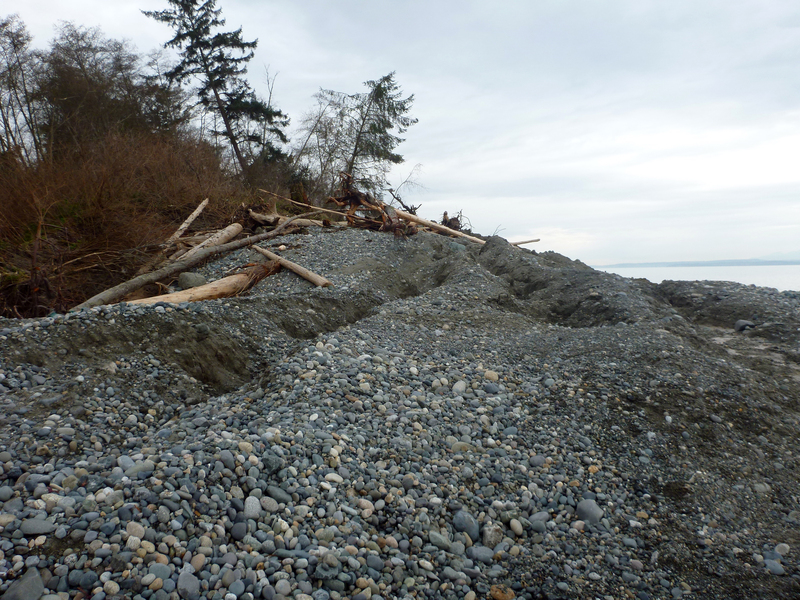 The landslide on Whidbey Island raised the beach below 30 feet. 5:57 p.m. (3/27/2013): DNR geologists complete their initial assessment. No large lateral cracks or crevices were observed on the undisturbed land at the top of the landslide. The volume of soil displaced by the slide has piled up along the shoreline, pushing it to as high as 30 feet in some areas. The slide appears to be a combination of rotational and a translation slide (more to come about that). Portions of a road accessing about 17 homes was displaced (destroyed) by the slide, making those homes inaccessible by vehicle. 3:23 p.m. (3/27/2013): The landslide is rotational* and about a quarter-mile wide. 2:00 p.m. approximately (3/27/2013): DNR geologists arrive at landslide site to begin assessment of causes and risks. 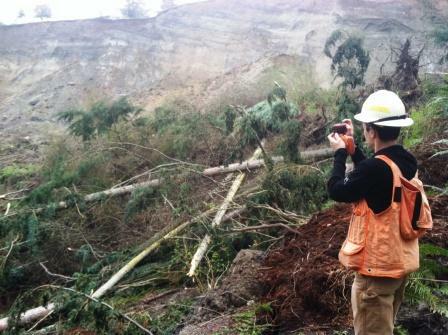 DNR will post information on the Whidbey Island Coupeville landslide on this blog page. For updates, please follow @waDNR_fire on Twitter and track hashtag #WhidbeyLandslide. Landslides occur every year in Washington State. Our climate, topography, and geology create a perfect setting for landslides. What do you need to know about landslide? In Western Washington, the majority of landslides are triggered during fall and winter after storms dump large amounts of rain or snow. Landslides can be categorized as shallow or deep-seated. Shallow landslides are common in Washington, often forming as slumps along roadways or fast-moving debris flows down valleys or concave topography. They are commonly called “mudslides” by the news media. Deep-seated landslides are often slow moving, but can cover large areas and devastate infrastructure and housing developments. Shallow landslides typically occur in winter in Western Washington and summer in Eastern Washington, but are possible at any time. 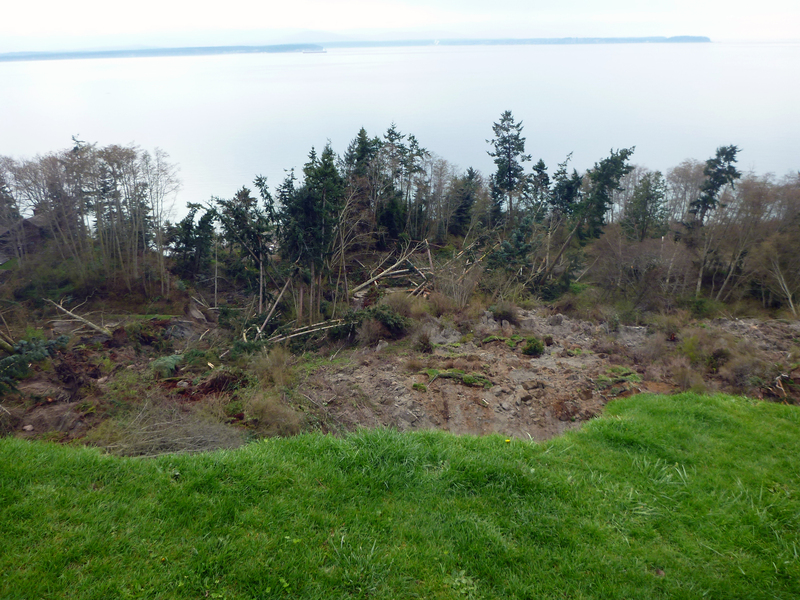 DNR geologists believe the Whidbey Island Coupeville landslide to be a deep-seated landslide. Newly developing cracks, mounds, or bulges on streets, sidewalks, or the ground. If you notice signs of a shallow landslide, leave the area immediately if it is safe to do so, report the problem immediately to your local Emergency Management Agency. http://www.emd.wa.gov/myn/myn_contact_info.shtml. The frequency of landslides and their effects can be reduced by appropriate land-use planning and more stringent engineering requirements for construction on hillsides. Information about slide-prone areas is now readily available, so every homeowner should obtain this information and take necessary precautions. Links to free information are given below. And, as always, please report any landslides you see — first to 911 if there are injuries or property damage and then to DNR — even the small ones — for our database. Thanks to all who have contributed already. Here’s how to report a landslide to DNR. Before and after photo above is credited as follows: Before photo of landslide area – Washington State Department of Ecology shoreline oblique photo. After photo of the landslide area – King 5 News Seattle. Great Alaskan earthquake hit 49 years ago; effects felt in Washington State, too.